Resident Evil VII is out, and our review is in. Some people love it, others think it's pretty good. I personally loved it, but even if you've played the game from beginning to end on your TV, you haven't lived until you've experienced this title in virtual reality. Resident Evil VII is a scary game. Yes, it does tend to waver into the action genre in the latter half, but overall it's a terrifying experience. While I had some fun with the last few games, this one truly feels like a return to form for the series. It's also worth noting that this is the first AAA title to be fully playable from beginning to end in virtual reality. 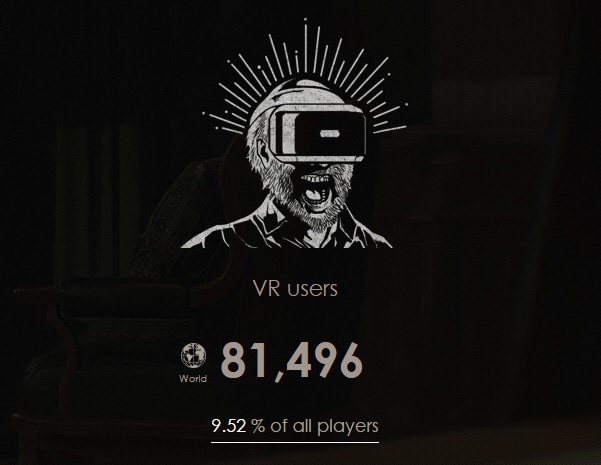 Combine that with the fact that over 80,000 players have played in VR (10% of all who bought it), and you have a huge win for this type of gaming. Considering also the fact that this data only comes from people who have opted to submit their data, and the number could be even higher. So, how does the game compare when you're wearing a screen on your face? Well, as you can imagine, the experience is far more intense. That doesn't necessarily mean it's 100% better, but it does offer a very authentic way to experience the world. Let's start with the good. 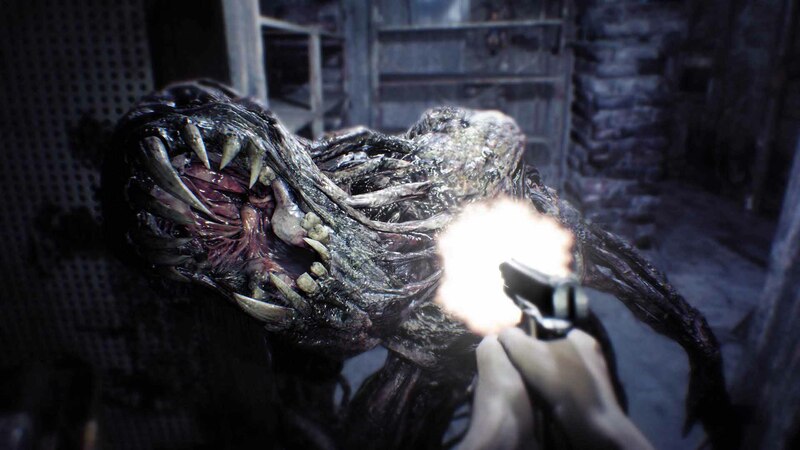 Resident Evil VII is a lot scarier in VR, and it's also a lot more immersive. These are buzzwords you hear a lot when people are discussing virtual experiences, but it's more evident here than it has ever been. This is due in large part to the excellent art direction and design that RE7 offers. The dilapidated halls and disgusting environments add a lot to the atmosphere. Combine this with effective jump scares, the constant stalking of enemies like Jack Baker, and exquisitie sound design, and you have a recipe for true and lasting fear. With a VR headset on, you're in this detailed and horrifying world. You can't escape by looking away, because no matter where you look, it's always there. I think that's something a lot of people miss when they haven't played VR personally. You're in the world, for better or worse. Yes, you could always take the headset off, but when things hit the fan, it's in your face. When an enemy lunges forward and grabs at you or shoves a knife in your face, you see it coming right at you. The 3D audio also means that you'll hear Jack Bakers whispers and yelling all around you. When you're exploring, those creaks and groans that made you uneasy will be right in your ears and on all sides. It's immersive to the point of being oppressing for the light of heart. Continuing with the positive aspects of the VR experience, let's talk about aiming. When you're playing RE7 on a standard TV, you get a somewhat sluggish aiming method using the right stick. In VR, you aim with the movement of your head, which is far more responsive by a long shot. It makes combat much more satisfying, and headshots come easy in this mode. I also like little touches like when you're in the main menu. In VR, you see the menu floating in front of you, and looking around allows you to see that you're sitting in your saved game's last save room. It's a nice touch. Let's talk negatives. Unfortunately, the VR experience isn't perfect. For starters, the game has a huge list of comfort options to help people who get nauseous. This isn't a bad thing, but even with all of the comfort options turned off, it's still not a seamless experience. You can employ things like a decreased FOV while moving, a staggered turning solution, a slower movement speed, and a smoother transition when crouching. These things are great for comfort purposes, but they leave you at a disadvantage in terms of being able to respond and run from threats around you. If Jack Baker is bearing down on me with a shovel, I don't want to stand in place and stutter turn 30-degrees until I can get away. I want to turn and run like I would in the standard game. Of course, doing so could make many people sick. Without several of the options turned on, I certainly started to feel woozy after an hour or two, but I also wanted the most seamless experience possible. Unfortunately, major cut scenes are displayed in a cinematic mode with the screen floating in front of you. During action sequences, there's a distinct pause between moments that hurt the flow for me. Furthermore, Ethan's hands are displayed as disembodied, floating appendages in VR, as opposed to the full arms he has in the standard game. A pair of floating Rayman-style arms kind of breaks the immersion for me to an extent here. Finally, the subtitles float in front of you when they're turned on. If Ethan bends down or gets too close to something in a cut scene, they clip through the object or person in front of him. And of course, there's graphics. I'm playing on a PS4 Pro, so the difference, while noticeable, wasn't too bad. I'm hearing that the downgrade in graphics is a bit more profound on standard consoles, so definitely keep that in mind. This is just a realistic expectation though, considering the power needed for VR to begin with. It most certainly looks better on a TV, but on a PS4 Pro, it looked very comparable in VR. The VR in Resident Evil VII can come across as sloppy in some areas, but I'm not discounting what Capcom has done here. A full game like this in VR, regardless of some compromises, is a huge feat. I wish that a couple things like the floating arms had been the same as the main game, and sickness will happen if you opt for a smoother experience in VR, but I can't deny the power and presence that it provides. This is, easily, one of the most compelling arguments for PlayStation VR. Even with the flaws and downgrades in graphics, there's no denying the exponential jump in fear and atmosphere you get when you play this game in virtual reality. If you have the game and you have VR, you need to do a play-through this way. I opted for a standard run for my first time, but if you can go into this fresh in VR, it will be even more terrifying. 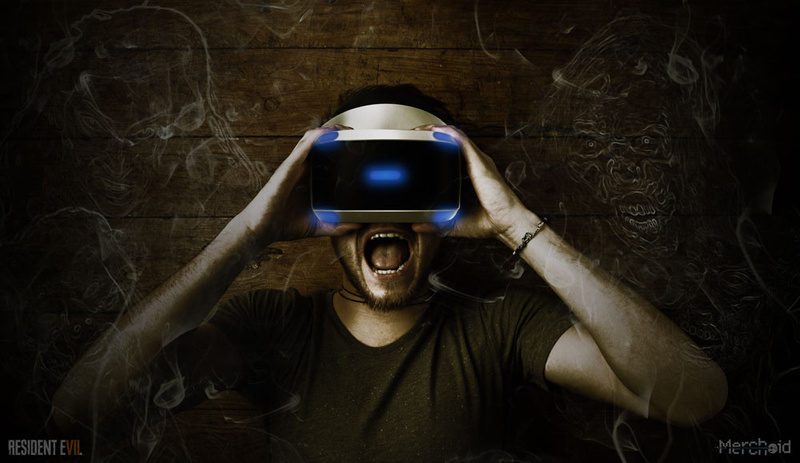 Don't opt for the VR version if you're easily scared or you get sick easily. You'll have more problems than most, even with the comfort settings on. Playing RE7 on a TV is an excellent, and most importantly, scary experience. Doing the same thing in VR? Well, let's just say you're going to need a stiff drink or a diaper, possibly both. Now, it's worth mentioning that the Ethan Must Die mode is not VR compatible. That being said, it's the mode that benefits the least from VR, so I don't mind. Let's take a look at these three items in the Banned Footage pack and see if they're worth your time. If you bought the season pass, make sure you download these as they are included in your purchase. This also counts if you bought the Deluxe Edition of the game on PSN, which includes the season pass. You can access this content by going to "Extra Content" on the game's main menu. The first two modes are under the "Banned Footage V1" and the other mode is listed separately. First up is the Bedroom tape! I'm starting with Bedroom because it's the best piece of content in this first pack, hands down. If you enjoyed some of the escape the room puzzles in the main game, then this will be right up your alley. In this DLC, you play as the cameraman Clancy from the demo and parts of the main game. He's been locked in a bedroom in the Baker house and needs to find a way out. What makes this so unique, is the mechanics they employ. As you search the room for solutions, you'll hit milestones that cause Marguerite to come back and investigate what you've been up to. Thankfully, she doesn't randomly show up, you have a heads up when it's going to happen. This makes it fun, but not frustrating. The thing is, if you leave anything out of place when she comes back, she'll know, and you'll get a good old fashioned whooping unless you can talk your way out of it. It's intense and exciting. The design of the puzzles makes it a decently tough nut to crack, so you'll get at least an hour out of this DLC, or more if you have trouble finding the solutions. All of it comes together into the strongest puzzle Resident Evil has seen since the original title. It doesn't add a ton to the story, but it is an excellent piece of content for fans of the game's escape the room mechanic. Nightmare mode is a close second for me. I know that, for many, this may feel like a raid mode that should have been included with the game, but I really enjoyed having this option, especially in VR. In this mode, you take control of tormented cameraman Clancy as he's thrown into the basement of the Baker house by Jack Baker. You must survive until morning while fending off the Moulded. You can explore the basement and find hidden areas and set up traps. You'll also power on compactors that generate scrap. These can be visited during waves of enemies to collect the currency. You can bring your scrap back to a table and craft weapons, ammo, and health. You can also spend scrap to upgrade your health and ammo capacities. It's a great gameplay loop, especially when Jack himself shows up as a boss of sorts. I played this mode in VR, and it was insanely fun. The aiming mechanic that allows you to aim where you're looking makes this mode far more manageable as you can get headshots with ease. As you accumulate points for subsequent attempts, you'll unlock new guns and options to get the upper hand. Finishing the game once also unlocks a "night terror" mode, which is even more difficult. This piece of the DLC also doesn't add much to the story, but man, it is insanely fun and replayable by a large margin. Some people like a challenge and enjoy repeating things until they get it right. As someone who doesn't have a lot of time for gaming in my busy life, I like to limit how many attempts are required to finish something. It's why I've never gotten into games like Dark Souls. For fans of these ultra-difficult games, Ethan Must Die is right up your alley. This alternate mode has you picking up randomly generated items as you run a gauntlet through the Baker house and out to the greenhouse where you'll face off against Marguerite. You can't take really any damage, though, and since the items are random, you may not get good options on any given play through. This is something you'll retry again and again to memorize enemy placements and get the best weapons. It's not for everyone, but it does provide a satisfying challenge. That being said, it's the weakest of the three modes in this DLC pack in my opinion. For $10, or as part of the season pass, you can't go wrong here. If you like the sound of any particular mode here, you'll get your money's worth. If you're like me, and you enjoy the idea of all three, then it's a no-brainer. This may have come out a week after launch, but if this is what they can accomplish for the first, quick DLC release, I have high hopes for the future of this game's downloadable options. The first pack of DLC was good, but it felt like an appetizer. Lots of great flavors, but it was over fairly quickly. Thankfully, offerings like the Nightmare mode made it highly replayable. Does the second pack of DLC manage to provide a more substantial offering for its increased price point? This DLC takes place before the Bakers were infected. It's an exciting glimpse into the lives of normal people before their entire existence was turned upside down. 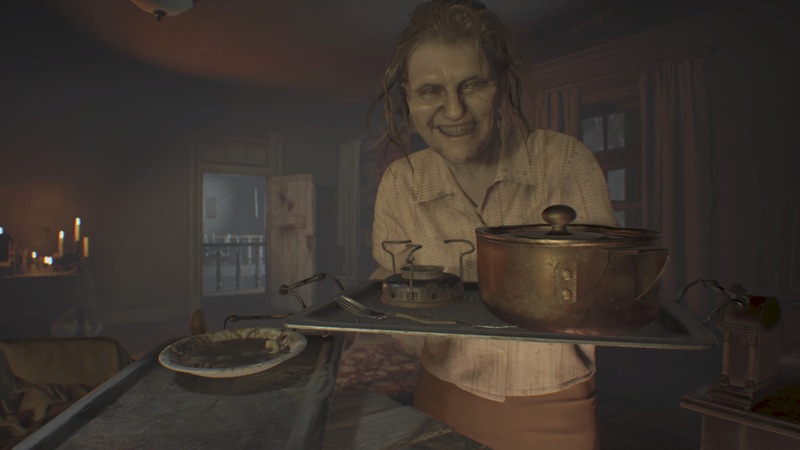 This DLC opens with a painful reminder of how human the Baker's were before they fell into this mess. In the midst of a hurricane, they've take several people in to shelter them from the store. Marguerite speaks with a soft, motherly tone, while Jack sounds like the kind of wholesome soul we all strive to be. It honestly made me sad. You expect to hate these people, seeing as how they're the bad guys in the main game, but Capcom has done a phenomenal job making them feel human, despite what happened to them. It doesn't take long before things get scary. You're playing as Zoe from the main game and she has no idea what's happening, nor does the rest of the family. This DLC does have two endings, and you'll most likely get the bad one first. It's a good little addition to the game, especially if you get the good ending. It's a bit on the short side, but any glimpse into life before the Bakers were changed is something I welcome with open arms. It does, however, feel like something they could have included in the main story. Who knew that I would thoroughly enjoy a Resident Evil themed game of Blackjack? In this new mode, you play as the tortured soul Clancy as he's placed into a game of Blackjack with another character named Hoffman. Lucas Baker oversees the proceedings from a remote location. Meanwhile, you're both hooked up to devices that can quickly and efficiently cut the fingers off of your hand. You play like any other game of Blackjack would go, minus the finger traps. There are also trump cards (pun intended I suppose?) that can be used to alter the rules or tip the odds in your favor. You'll go through several rounds and you'll lose more than just your fingers by the time it's done if you're not careful. The initial version of the mode is random to a point, but at a certain spot in the final rounds, you'll need to perform a very specific action if you want to win. I was initially disappointing by this, because I liked the idea of a purely luck-based gambling mini-game. I know other people would prefer something they could easily finish, but a gory game of Blackjack sounds fun to me. Well, luckily you can unlock a survival and survival+ mode that gives you exactly that. These modes have you going up against more intense opponents and you'll need to survive more round than before if you want to finish them. Overall, this mode is simple, but effective. People may get turned off by the luck-based aspect of the later modes, but I find that it gives me more reason to come back later. The only way this could have been better, is if Capcom made it an online multiplayer experience where you risked life and limb against another human player. That would have been amazing, but what we have is the most fun I've had playing cards in a long time. Try it in VR for an added effect! Up until now, Resident Evil VII has been very serious and very scary, but we all know Resident Evil has its roots deep in the realm of cheese and it most certainly has a sense of humor. Well, we've seen Capcom's return to weird and whacky side modes with Jack's 55th Birthday. This hilarious mode starts with you standing in a room where Jack Baker, in all his terrifying glory, is sitting at a table dressed in a birthday hat and a clown nose. Uh, what? This mode has you searching several different stages for types of food you can bring back to Jack. The goal is to fill him up, but you can't just feed him anything. You need to find dishes, which can be combined with spices for added effect. Meanwhile, the Moulded will come at you with party hats of their own while catchy music plays in the background. Jack will constantly yell at you about how he's "Wastin' away here!" as you're fighting. You can equip weapons and ammo, even upgrades too, but that limits the space you have in your inventory to carry food for Jack, so there's a bit of strategy to it all. You're timed, but you can increase the timer by killing enemies. It's odd, weird, and totally hilarious if you let it be. You can't play it in VR, but it's the only mode of this pack that doesn't work. I read some speculation that VR's aiming accuracy is the reason behind them not making this compatible, as it would give players an unfair advantage on the leaderboards. I suppose I can understand that. The aiming is VR is incredible. If you don't mind the offbeat tone, this is one of the better DLC experiences thus far as it has a solid amount of content. For $14.99, this DLC adds a good amount of story, value, and replayability. It's worth having if you enjoyed the main game.